Wow, what a day of exhilarating action on the gridiron. Championship Sunday in the NFL has concluded, Super Bowl XLVI is set, and it will feature a rematch of Super Bowl XLII as the New England Patriots will clash with the New York Giants at Lucas Oil Stadium in Indianapolis. The Patriots did not play their most complete game of the season Sunday, but it was enough to down the Baltimore Ravens by a score of 23-20 in Foxbrough. The Giants rode their white-hot all-pro quarterback Eli Manning to a 20-17 victory in overtime against the San Francisco 49ers. 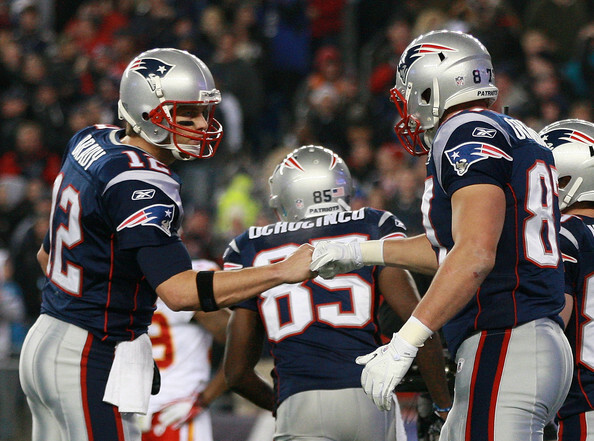 Let’s take a deeper look at how both New York and New England reached Super Bowl XLVI. Tom Brady, Bill Belechick and the New England Patriots need to send Billy Cundiff a thank you card. No, seriously. And Billy Cundiff…you’re as good as dead to Ravens fans everywhere. Nick Lowry, anyone? Usually the Patriots don’t need any help in vintage championship game settings, but they sure got it Sunday as they defeated the Baltimore Ravens by a score of 23-20 to reach the Super Bowl for the 5th time in the last decade, and the 7th time in franchise history. Both Tom Brady and Joe Flacco played well, but in the end it was Brady’s bunch that came out on top. Two plays separated the Baltimore Ravens from reaching the Super Bowl. But it was those two plays that secured the Ravens’ place in the NFL history of heartbreak. Cundiff’s missed field goal and Lee Evan’s drop in the end zone in the waning seconds sealed Baltimore’s fate on this day. Cundiff should have made the 32 yard field goal. Evans should have caught the ball in the back of the end zone for the touchdown. Baltimore should be going to Indianapolis representing the AFC in the Super Bowl. The scoreboard, however, said otherwise. Give New England credit, though. They did everything they had to do to win the football game. Tom Brady didn’t play his greatest game (22/36, 236 yards, 2 INT’s, and a passer rating of 57.5) and was actually outplayed by Joe Flacco (22/36, 308 yards, 2 TD’s, 1 INT, and a passer rating of 95.4.) But the Patriots made the plays when they needed to, and the Ravens did not. Of all the heartbreaking games the Ravens and their fans have endured over the past 4 or 5 years, this one has to sting the most. Baltimore outgained New England, controlled the ball for nearly 8 more minutes than the Patriots, and won the turnover battle. They did everything they had to do, except win. So New England moves on and will look to avenge their loss in Super Bowl XLII when they face the New York Giants, a team that beat the Patriots at Foxbrough back on November 6th by a score of 24-20 while the Ravens are watching, once again, from the couch. I’m beginning to wonder – will Baltimore ever get over the hump? It seems as if the New York Giants have their own formula for winning big games; in overtime and on the road is preferred. And with the foot of one Lawrence Tynes. Eli Manning and the Giants escaped Candlestick Park with a 20-17 victory in the NFC Championship game over the San Francisco 49ers; another classic slugfest in this decades-old postseason rivalry. Five months after declaring he is in the same class as Tom Brady, Manning will get another chance to outdo Brady on the NFL’s biggest stage for the second time in four years. He outplayed Aaron Rodgers and the defending champion Packers last week, then fellow former No. 1 pick Alex Smith and upstart San Francisco the next. But this game wasn’t all about Manning. With just under 8 minutes remaining in the contest and San Francisco nursing a 14-10 lead, 49ers return man Kyle Williams muffed a punt at his own 32 yard line. Manning and the Giants took advantage and drove 32 yards as Manning hooked up with Mario Manningham on a 17 yard post pattern to put the Giants out front 17-14 with just 6 minutes to play. San Francisco answered with a 7 play, 48 yard drive highlighted by runs of 17 and 21 yards by rookie running back Kendall Hunter. The Niners failed to reach the end zone, but tied the score on a 25 yard field goal by David Akers with just 4 minutes remaining. The teams exchanged possessions numerous times in the final 4 minutes of regulation, but neither offense could thwart any significant threat. The game headed to overtime with the two teams nodded 17 each. The Giants won the coin toss, but failed to move the football on their first possession of the extra period. Alex Smith and the 49ers also failed to put themselves in a position to win the football game on their opening drive of overtime. Upon another 3 and out by the Giants, New York was forced to punt again. Oops, he did it again. He being Kyle Williams. He fielded the punt and began to run up the seam where he was met by Jacquain Williams who stripped the ball from Williams. Logan Thomas, who had recovered Williams’ previous fumble that set up the last New York touchdown, was right there to pounce on it. The rest was history. Ahmad Bradshaw galloped down inside the 10 yard line and Eli centered the ball for Lawrence Tynes to kick the Giants to the Super Bowl for the 2nd time in 4 years. As soon as Tynes’ foot glanced the ball, he knew he had hit it. Eli Manning went 32 for 56 for 316 and a pair of touchdowns in his record fifth career road playoff win, and New York’s fifth win in a row overall. “Easy E” could potentially claim the title of “best Manning” if he can get a win in Super Bowl XLVI. Victor Cruz again had another phenomenal game as he caught 10 balls for 142 yards. Hakeem Nicks added 5 catches of his own, accounting for 55 yards. Mario Manningham had only 1 reception, but it was a big one. Bradshaw added 74 yards on the ground on 20 carries. San Francisco only converted once on third down all night (1 for 13 overall) and Alex Smith failed to get the passing attack going. If not for the 152 yards on the ground for the 49ers, the Niners’ offense likely would have struggled mightily. Vernon Davis caught touchdown passes of 73 and 28 yards and wound up with three catches for 112 yards for the NFC West champion 49ers (14-4), who went from 6-10 a year ago to a contender and ended an eight-year playoff drought. The future is bright in the Bay Area for Jim Harbaugh and the Niners.
. Let the trash talking begin. Patriots vs. Giants. New York vs. Boston. Rematch of one of the greatest Super Bowl’s ever. Let’s hope Act 2 is as good as Act 1. This entry was posted in Football, Home, National, Uncategorized and tagged Super Bowl, Tom Brady, Vernon Davis. It’s been rumored that orthopedic surgeons and several oncologists from Sloane Kettering and Johns Hopkins hospitals alike would like to amputate Billy Cundiff’s right leg . Your thoughts on the matter ? As for Kyle Williams it’s been rumored that the US Marshals are prepared to place him in their WITSEC program for his own protection. Pity , he was unable to do that with the damn ball during the game ! I say cut it off or at least cut him from the Ravens roster. That miss was so bad it will hang over him for the rest of his career. Cut both off and at the same time remove his testes so that he can’t produce any male off-spring whose ambition one day might be to play in the NFL ! ‘nough said ! It appears this rematch will be a more wide open affair than the last one. If it even approaches the excitement of their last tilt, it will be fun.